Parkinson’s disease is a progressive disorder of the nervous system that affects movement as certain nerve cells in the brain gradually break down or die. Many believe Parkinson’s disease is a death sentence, but if treated, the disease is manageable for those who have been diagnosed. South Central Regional Medical Center is hosting a Parkinson’s Awareness Day on Thursday, April 25 to educate and demonstrate how to manage disease. The event will include Parkinson’s disease exercise sessions with certified therapists and education sessions from local healthcare providers on overall health needs. Parkinson’s disease patients and their caregivers are invited to attend. Refreshments will be provided. The event is free, however a reservation is required. Please reserve by calling Kourtney Murphy at 601-399-0534. There are a lot of productive years of life ahead for a person diagnosed with Parkinson’s disease. The symptoms of Parkinson’s disease are not always noticeable, but some of the most visible symptoms are tremors, stiffness and speech changes. Parkinson’s disease can be very painful and disabling for patients before treatment. Once a patient receives treatment, there is a major difference in their quality of life. They are able to return to work with less difficulties, enjoy life and participate in family activities. South Central Regional Medical Center hosts a therapy treatment program called PWR! Moves, which stands for Parkinson’s Wellness Recovery. The program is based around movement which assists people diagnosed with Parkinson’s because mobility is one of the senses that is lost. Simple, daily tasks such as being able to get in and out of a car or being able to walk is very difficult. The PWR! Moves program teaches Parkinson’s disease patients how to regain control and become more functional. Together with community representative, Mrs. Meg Moore, the rehabilitation team created a support group for those with Parkinson’s disease to engage themselves in the PWR! Moves. 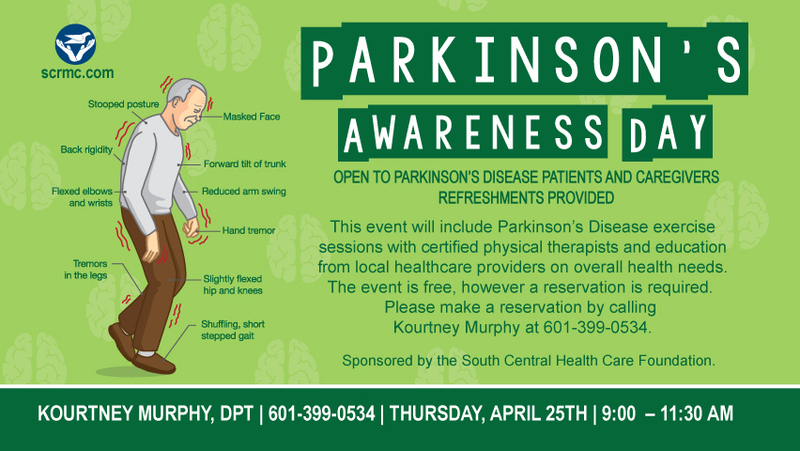 This support group is an educational and active group that will learn more about Parkinson’s and work with Murphy to complete the exercises of the PWR! Moves curriculum. “This group is very important because every person who has Parkinson’s feels as if they are alone in their journey. Some may feel embarrassed or feel like a victim, but together we can encourage each other and progress as a group,” states Mrs. Moore. South Central Regional Medical Center encourages those who would like to learn more about Parkinson’s disease or the PWR! Moves, to attend the Parkinson’s Day Event on Thursday, April 25 at South Central Place in Laurel at 2260 HWY 15 North. The event will include Parkinson’s disease exercise sessions with certified therapists and education sessions from local healthcare providers on overall health needs. Parkinson’s disease patients and their caregivers are invited to attend. A light lunch will be provided. The event is free, however a reservation is required. Please reserve by calling Kourtney Murphy at 601-399-0534. This event is open to the community. The event is sponsored by the South Central Health Care Foundation, whose goal is to improve community health and provide health resources with funds raised throughout the year. The South Central Health Care Foundation was established in 1992 and serves to inspire charitable giving that improves the health of the community.